He escaped from prison long ago and since then have been living in the woods. Police went crazy trying to find him, but the woods were so tight that he was able to hide well enough. Last year a new house was built at the edge of the woods. A house with adventurous kids. The kids would explore the woods from time to time. A boy and a girl, like Hansel and Gretel. They were thin and tiny. He watched from his hideout. This post was witten in reponse to the August 9: Flash Fiction Challenge, hosted by Carrot Ranch. It’s been a while that I don’t write. Life has been busy and creativity not being exercised. Hopefully I’ll find some more time, but no promises here…. It was their Senior year in high school. Prom night was coming and that’s when they were planning to give themselves to each other in full. The chosen place was a treehouse at the backyard of an abandoned house. Although shabby on the outside, the inside looked like a fairytale. He lays her down gently at the mattress. When things start to get hot, he remembers he forgot the condoms at the car. He goes to the car, opens the glove compartment, and presses the button of a little remote control. Amongst shrapnel and wood chips, she rains around him in bits and pieces of flesh and blood. 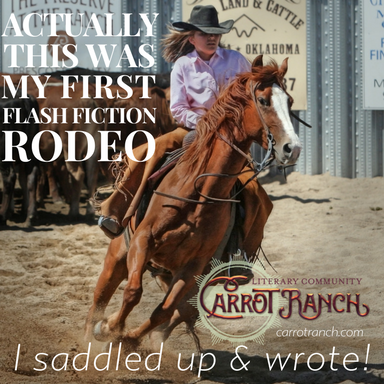 This post was written for the Flash Fiction Rodeo Contest #7. The image that came to my mind as inspiration was the last one in the story, then I wrote a story around it to fit. Originally I thought it would be a 299 word story, which allowed me to add many more details. Those details are gone, but I guess the shorter version ended up pretty nice too. The winner for this contest was announced today at the Carrot Ranch. 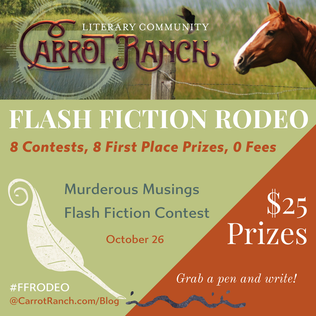 Today, Carrot Ranch website is starting a Flash Fiction Rodeo Contest. They’ll be having 8 contest, every Tuesday and Thursday, starting today and going until the end of the month. I heard about it a couple weeks back and was planning to post my entries here, but because it’s a competition they advise not to publish until judging is finished. So no post today with my entry for the first one. I’ll instead post in on the day the winner is announced. And for today’s contest that will be on November 7th. So stay tuned! Good writing to us all! Get up. Wake up the kids. Have breakfast. Get kids ready to school. Walk them to school. Work from home. Automation won’t work, do it manually. Stop to go to the doctor. Come back to a meeting. Work non-stop until 3:25. Bring suitcase down for hubby. Pick up kids at 3:30. Drive kids to sports practice. Back home, iron hubby’s shirts. Fix dinner. Do the dishes. Help hubby pack for his trip. Read a bit. Go to bed. And that migraine is still there until end of day Friday…. They met very young and were best friends forever. Then each went on with their separate lives. But all the time, they still had each other at the depths of their minds. One day, they meet again. They look at each other and see time flying backwards all the way to their childhood together. “Hey, It’s been so long without seeing you”. They hold hands for the first time in ages, and from that time on, they never went apart again. As if they were in a constant honeymoon. Their time had finally come! This post was written in response to March 9th: Flash Fiction Challenge, hosted by Carrot Ranch. The story was actually taken, and adapted to fit the size constraints, from another piece I wrote a couple years ago for a Literary Lion challenge about Time. If you’re curious, here’s the full story I wrote at that time. Hope you enjoy! The monkeys jumped from branch to branch among the forest trees. Nice, but it wasn’t like flying. Sometimes they would climb all the way to the top of the tallest trees to look at the sky and dream of flying high. 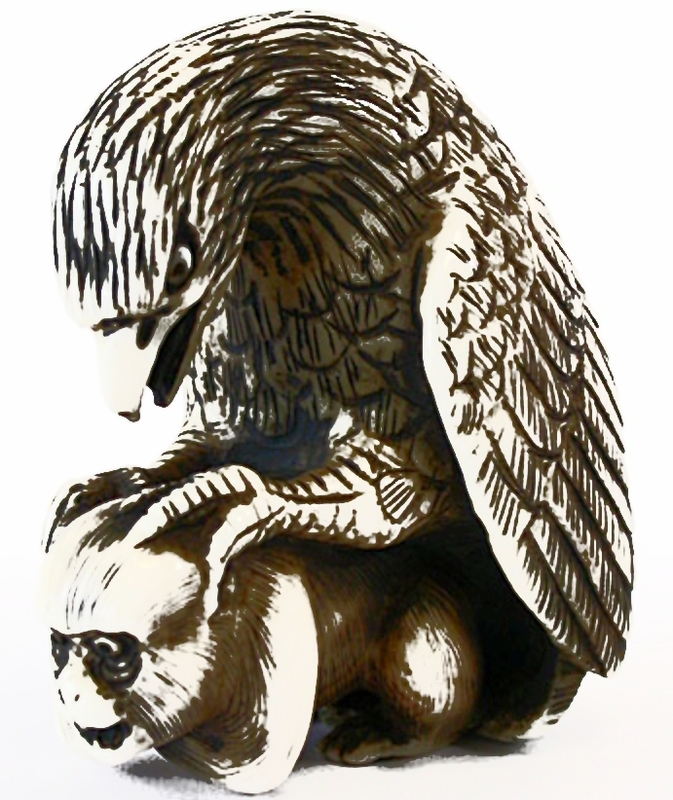 Every time the lucky eagles would come by, they would ask them to tell the stories they saw from up above. One day, the eagles decided to surprise the monkeys. Each one of them took a monkey on their claws and took them away for a ride. The monkeys were in ecstasy! They were flying monkeys at last! This post was written in response to the November 2: Flash Fiction Challenge, hosted by Carrot Ranch.